Having a bug with level up, I have more than 100% of the required XP but the game is broken and not reporting correctly my right level nor showing how much to the next level like it should. 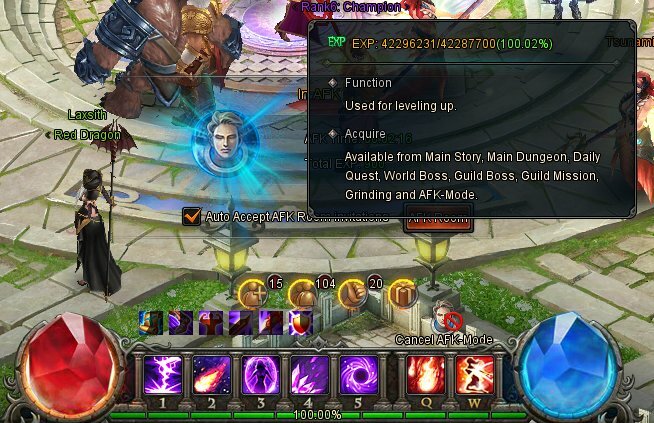 Instead it is showing an invalid 100.02% progress to level 80. Dear player, congratulations on reaching lvl.80, which also has been our level cap. I believe you are the first one on our servers! boooo,you beat me by a day lol........congrats................did i read that right cif?,80 is the level cap for now? Well technically still 79 since 80 itself doesn\'t yet actually exist so am level 79 +126.10%. Sounds like you are saying that this will increase though cif? One other thing to clarify since I do seem to be building up EXP even beyond the end of level 79 will the extra 11 million and counting worth of EXP carry over into level 80 and beyond (if it gets that far) once they exist? Devs will increase this so all players can go higher than level 80. This should change in a future update in server. Have a nice time playing the game! 2019-4-21 18:46 GMT+8 , Processed in 0.113445 second(s), 48 queries .